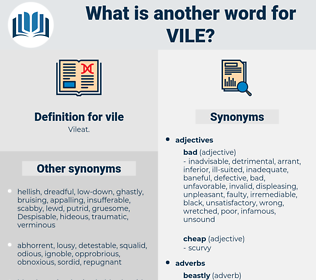 What is another word for vile? despicable, heinous, loathsome, disgusting, abhorrent, odious, hideous, evil, sordid. insufferable, wicked, appalling, ghastly, horrendous, unspeakable, dreadful, deplorable, miserable, lousy, detestable, horrific, reprehensible, malicious, repugnant, filthy, wretched, gruesome, horrid, horrifying, monstrous, abject, outrageous, sinister, egregious, dirty, inclement, revolting, dishonorable, ugly, unholy, shameless, insidious, live. abominable, ignoble, contemptible, horrible, infamous, disgraceful, cowardly, dastardly, obnoxious, vicious, atrocious, shameful, hateful, ignominious, repulsive, awful, foul. honorable, gentle, agreeable, moral, comforting, helpful, decent, friendly, attractive, pleasing, nice, good, respectable, happy, noble, desirous, right, Uncorrupt, virtuous, pleasant, kind, safe. intellectual, perfect, chaste, uncorrupted, refined, respected, worthy, blameless, reputable, intelligent, permissible, upstanding, enlightened, inoffensive, humane, impressive, imposing, approved, incorruptible, knockout, authorized, just, licensed, endorsed, irreproachable, shapely, legitimate, clean, spotless, law-abiding, squeaky-clean, great, guiltless, lily-white, prepossessing, pure, proper, correct, immaculate, permitted, unerring, white, decorous, supported, high-minded, high, unobjectionable, exalted, sanctioned, upright, grand, taking, encouraged, esteemed, legal. Their motive was as simple as their conduct was vile. The body is vile, Myrrhina.